• You must pay the remaining balance upon arrival in CASH, we do not take any credit card. • At check-in we collected a refundable deposit of $20 for the keys and towels that must be pay in cash without any exception. • In case you lose your keys or towels we will be forced to keep the $20 deposit to pay to replace them. • Our front desk works from 9:00am to 10pm. If you will be arriving after 8:00 pm, you must inform us know prior to your arrival so that we can leave detail instructions about your arrival and check-in with our security guard. • If you are staying in a dorm room, lockers are provided for you to safely store away your belongings. We do not supply the lock so you must bring your own or we sell them for $5 at the front desk. • Check in is officially at 3:00 pm, but if you arrive earlier feel free to stop by, store your bags (free of charge), use the facilities. For check in, we require valid government issued photo ID. • Not to use the kitchen and to keep silence after 10pm. • The use of cannabis, cocaine or any other illegal substance within our facilities is totally prohibited. • To ensure the safety of you and other guests, for no reason we will allow the visit of any person after 10pm who has not made prior check-in or does not have a reservation at our facilities. • Any violation of our rules or any act that threatens the physical or emotional integrity of any members of our staff or guests will not be tolerated, and you will be asked respectfully to leave the property without the right to a refund. Surrounded by lush tropical gardens and only a few steps away from the surf break's, the best restaurants and the hottest clubs. 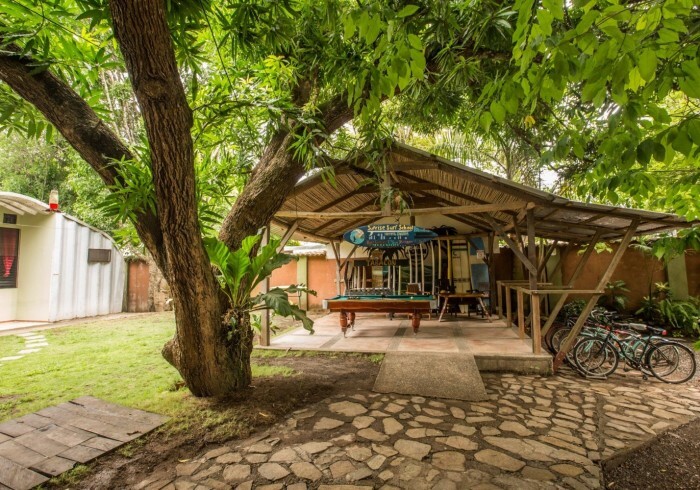 Jaco Inn is a boutique lodging and surf school situated right in the heart of Jaco's downtown. Whether you come only looking for accommodation or wanting to learn how to surf, you will always find something different to make your vacation an unbelievable and wonderful experience. Mi casa es su casa, since 2009 our goal has been to make you feel at home, this is an unique place where we welcome travellers from all over the world in an inspiring yet familiar setting. Blessed to be located on a property with a great family legacy, the tropical vibe of the jungle and Pura Vida is the perfect combination for your next adventure. Playa Jaco is busy town and the mainstream street has numerous restaurants and bars. There are several places to go at night whether you want to dance and party hard, or just take it easy while having a beer and listening to live music. At our hostel we offer a beautiful relaxing space away from all of that if you just want to come back and relax after a busy day or a long trip. We are located in downtown Jaco on a little hidden property behind the Orange Pub, a popular night club with a big sign in shape of an orange, which is located on the Intersection of the main strip Avenida Pastor Díaz and Calle Bohío. • Driving from San José: The easiest way to get to the central pacific is driving down Autopista Próspero Fernández or Route 27. Along the way, you'll encounter a series of toll booths that require change and small bills in local currency. You will need no more than 2,500 colones ($5 USD) to get to Jaco. After the 4th toll booth, at Coyolar, take the exit toward Carretera Pacífica Fernández Oreamuno/ Route 34th, at the roundabout, take the 1st exit onto Carretera Pacífica Fernández Oreamuno/ Costanera Sur/ Route 34. Drive 40 minutes more down the 34th until you reach to Jaco, exit the 34th in the second entrante to your right, where the a big Super Market name Maxi Pali is. Drive all the way down until you reach Avenida Pastor Díaz and make a left. Drive 800m until you reach "The Orange Pub" and make a left, Jaco Inn is right behind the pub. • From Quepos by bus: When you arrive to Jaco, tell the bus driver to drop you off in the main strip in front of "The Orange Pub". The bus stops 150 meter after, so you need to walk back in the oposite direction from the bus, Jaco Inn is located on the big property right behind the Pub. • From Puntarenas by bus: When you arrive to Jaco, tell the bus driver to drop you off in the main strip in front of "The Orange Pub". The bus stops right across the street from the Pub, Jaco Inn is located on the big property right behind it. Address 1: Avenida Pastor Diaz & Calle Bohio,.